In a few years, Slovenia's capital will on the grounds of the GR – Ljubljana Exhibition and Convention Centre Ljubljana gain the largest venue for fairs and congresses. Photo credit: Architecture office Ravnikar Potokar d.o.o. GR – Ljubljana Exhibition and Convention Centre Ljubljana (GR), which this year celebrates its prominent 65th anniversary, recently introduced plans for a new addition to its infrastructure. 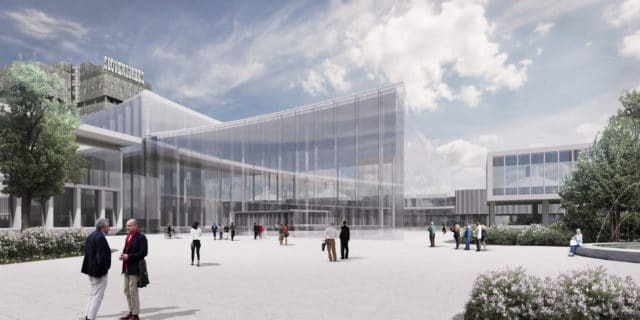 Namely, GR that boasts the largest event venues in Slovenia’s capital, is planning in a few years to welcome a new building which is going to be connected with the other buildings on the GR Premises. On the basis of the GR’s investment initiative and the project of the Architecture office Ravnikar Potokar d.o.o., it is anticipated that the hall will be partially covered in glass, so that it will allow the open view from Dunajska Road towards the beautiful Plečnik’s building in GR’s vicinity – the semi-circular Baraga Seminary that the most important Slovenian architect Jože Plečnik designed on the models of Rome’s Colosseum and Castel Sant’ Angelo. The gross floor area of the new GR’s building is planned to be 2630 square meters, a bit bigger than the largest Kocka Hall (A 2). The total height of the building is supposed to be 24 meters. In the ground floor of the building, the GR will gain the largest multipurpose hall in Slovenia, mainly intended for fair and congress activities. The hall will accommodate up to 4,000 guests. Above it, there are several smaller multipurpose halls planned for hosting congress guests. The specialty of the hall will be also in its green terrace. As the demand for GR is constantly increasing, the new building presents a great addition to the GR for it will enable one of the most important Slovenian venues to host even more of the large international congresses, while the hall in the ground floor will at least partially relieve the assembly halls that the GR puts together for the largest international fairs. The City of Ljubljana in mid-March introduced the plans for the building in Cannes at the 30th MIPIM, the world’s leading property market and announced that the estimated value of the investment is between five and eight million euros and that the construction, which will last approximately for one year, is estimated to start between 2022 and 2023.